An unlimited membership assigns a customer to a group indefinitely. This is easily set up with simple or variable products. When a customer purchases such a product, the account is added to the group once the order is completed or processing (see details on which order status will trigger the membership in the Settings). Proceed to the section about Selling Unlimited Memberships for a quick and easy guide that shows how to create such a product. Time-limited memberships assign a customer to a group for a certain amount of time. Once the established period is over, the account is removed from the group. These limited memberships are set up as easily using simple and variable products. In the section on Selling Time-limited Memberships you will find instructions on how to create a suitable product. Memberships can be used to sell access to digital media with Groups File Access (a premium extension for Groups) and other services like Amazon S3. Once a customer’s account is added to a group and while the customer remains in it, the account can access restricted files and temporary links or containers provided by external services. Please refer to the documentation on Groups File Access on how to use group memberships to provide protected downloads. Memberships based on subscriptions assign a customer to a group while the subscription is active. This requires the WooCommerce Subscriptions extension and works with subscriptions and variable subscriptions. The steps to set up a membership subscription are mostly equivalent to those used to create unlimited and time-limited membership products as described above, except that you will not find the settings for durations in the Groups tab of the product as the membership is valid while the subscription is active. As we have outlined above, a customer’s account can have its group membership established automatically through a sold membership. But there are cases where it is useful to be able to create a time-limited membership manually. Groups already allows to assign unlimited memberships, in addition to that, the Groups WooCommerce extension allows to specify a duration for group memberships. Groups provides built-in access control that allows to restrict access to posts, pages, and custom content types to specific groups and their members. When you sell memberships, you will most likely want to restrict access to certain content on your site so that only authorized users, customer who have paid for it, can access those contents. Please refer to the Access Control section of the documentation on Groups to learn how you can take advantage of the various access restriction mechanisms you have at your disposal. This might be obvious, but if you want to offer group memberships, you need to create at least one group. Please note that using the default Registered group to sell memberships is not a good idea. Any user account will always belong to this default group so it’s nothing special, except that only those with a user account belong to it – of course that includes your customers but visitors or those who are not logged in, don’t count. Go to Groups > Groups and click New Group. 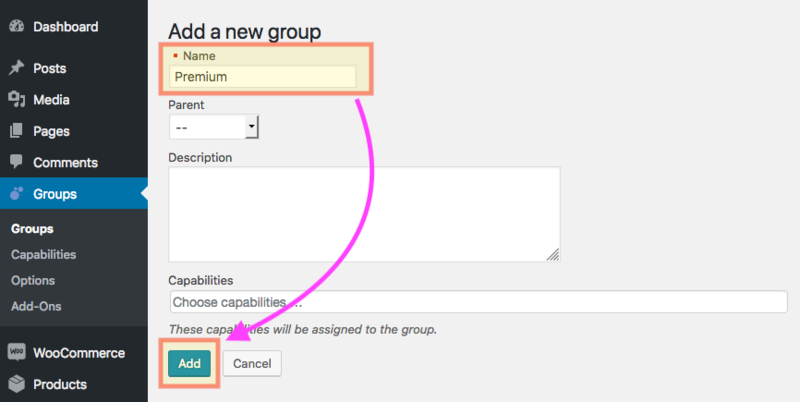 Enter Premium in the Name field and choose the premium capability, create the group by clicking Add. Now that we have our new Premium group, we can use it and sell memberships for it. To read more about handling groups, please refer to the Groups section of the documentation for the Groups plugin. For the reference, the Legacy Setup subsection provides information relevant only for use with the deprecated Groups 1.x or Groups 2.x using legacy access control. We do not recommend to use this in new setups and recommend to migrate to the new access control model where possible, following the Migration Guide.